College football started this weekend which means tailgating, finger foods, and maybe an adult beverage or two. 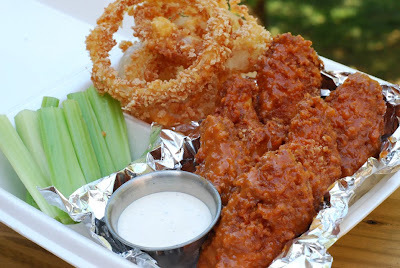 For a quick lunch today I deep fried some hot wings and onion rings. Lord of The Wings will snicker, because I breaded my wings. For a wing purist like LOTW, that is the BBQ equivalent of boiling ribs. I tried using panko in the breading. A bit too much texture, in my opinion but Alexis loved them that way. The sauce was a medium sauce that was half butter and half Fire Ant Juice. Excellent flavor! What is your favorite food for game day?